Here at Inhabitat we love multifunctional furnishings that allow people to adapt small spaces to suit different needs. Our latest discovery is Johannes Häuser’s ‘Klopf Klopf’, a clever furnishing that can be used as a kitchen unit, desk, a bookshelf or a wardrobe – and it can be assembled without the use of glue or screws to boot. klopf klopf from Johannes Häuser on Vimeo. Johannes Häuser‘s minimal and modular ‘Klopf Klopf’ is made of three different wooden pieces connected with colorful clasps. It is variable in height and length and it can be easily packed away for storage or moving. Its onomatopoeic name refers to the way is constructed – just watch the video above and hear the bangs! Here at Inhabitat we love multifunctional furnishings that allow people to adapt small spaces to suit different needs. 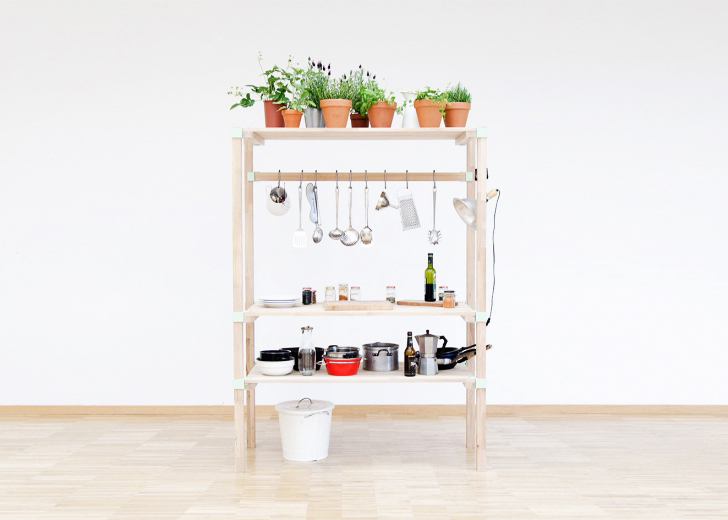 Our latest discovery is Johannes Häuser’s ‘Klopf Klopf’, a clever furnishing that can be used as a kitchen unit, desk, a bookshelf or a wardrobe - and it can be assembled without the use of glue or screws to boot.